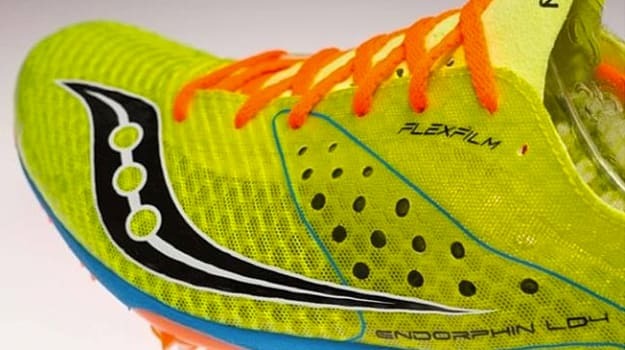 One of the lightest track spikes on the market is set to get even lighter next time around, as we get a sneak peek at what the latest version of the Saucony Endorphin LD series will look like. Earlier today via Instagram, Saucony shared a partial image of the ultra-light Endorphin LD4 middle-distance track spike, with a weight of just 2.8 ounces—a 0.3 oz drop from the previous model. Saucony has yet to release performance specs on the shoe, though, from the looks of it, the shoe will keep its FlexFilm upper (not to mention is trademark aerodynamic profile). Follow Sneaker Report for release information on the Saucony Endorphin LD4.